During late July, my brother-in-law and I set out on a short trek along the famed Appalachian Trail in the central portion of Shenandoah National Park, Virginia. Starting at Swift Run Gap southeast of Elkton, VA, we began hiking north late Tuesday morning. Little did we realize that our four day trip would be cut short by a culmination of circumstances. Tuesday morning we arrived at the AT trail head near the Swift Run Gap entrance station. In the weeks leading up to our trip, we did all the preparation necessary from planning our route to packing our bags. However, neither of us prepared ourselves physically. Even the morning we set out, strapping on our 60 pound packs, we did little else than spray some 100% DEET bug spray on ourselves before setting out on the trail, not even a stretch. Within the first hour, we realized this excursion would be anything but relaxing. We contemplated turning back right there, but knew we would regret it if we did. Onward we went, more uphill than down, backs aching and legs shaking with each step. Every so often, we would take a short stop to enjoy the view, sit down and rest, or eat a snack. In my case, I took this time to look at some of the surrounding geology. Most of the time, however, along such a wooded trail, it was hard to see anything other than small loose rocks. Eventually, I hoped to see some of the features along the trail such as columnar basalt, or run across some fossils in the sedimentary formations. This region, being an old mountain range, has a rich and exciting geologic history. 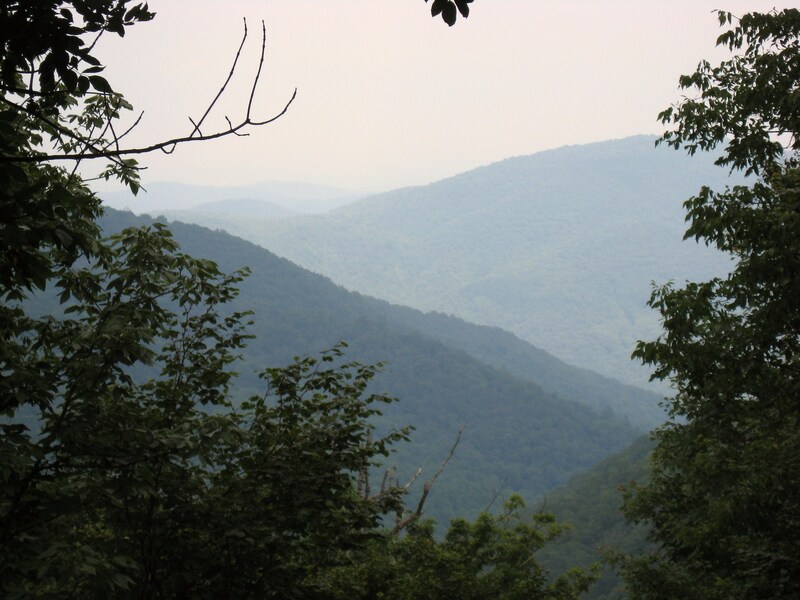 During Pre-Cambrian times, approximately 800 million years ago, the Shenandoah National Park would have looked vaguely similar, with hills reaching heights of 1,000 feet above the valleys below. Deeply eroded igneous rocks, including granite, made up the ground beneath the shallow soil which became thicker in the valleys due to the accumulation of eroded materials from the hilltops. Soon, however, the region exploded with volcanic activity as the earth rifted apart, producing immense fountains of fire and lava, violent explosions, and earthquakes. The lava flows filled the valleys and, eventually, drowned even the 1,000-foot hills. When over, this series of lava flows totaled around 2,000 feet in thickness, with about 1,800 feet remaining today. Normal weathering and erosion began to take place, resulting in the formation of soil, sand and gravel. The whole area would have appeared to be as a desolate wasteland, as land plants had not yet evolved, leaving the ground barren. Around 420 million years ago, the lithospheric plates began to shift – due to plate tectonics – causing North America and Europe to collide in what is called the Taconic Orogeny (named for the Taconic Mountains of New York State). Mountains began forming as the plates crumpled together like two car hoods in a head-on collision in slow motion. These mountains have long since eroded away through weathering processes. The collision itself destroyed the eastern part of the first Atlantic Ocean, called the Iapetus Sea, and greatly affected the regions north of the current Central Appalachians. The result was a great inland sea, termed the Appalachian Basin, which submerged the now ancient volcanic soil, lava beds, and igneous rocks. Over time, streams and rivers carried eroded sediments from the surrounding land masses into the Appalachian Basin, burying the volcanic and granitic basement rock in sand, silt, and clay. The presence of a diverse and flourishing array of marine invertebrates left behind evidence of their existence in the form of fossils, which formed when the animals died and were buried in the sediments of the Basin’s sea bed. Compaction and higher temperatures resulted in the process of lithification, forming the fossil-rich sedimentary rocks in the area. This marine paradise would last only a couple hundred million years, however, as about 250 million years ago, near the end of the Permian period, the lithospheric plates began forcing Euro-America and Africa together, closing the Appalachian Basin. The continent was crumpled, forming mountains and, in some places, thrusting parts of the African plate over top of the North American plate. The immense pressures involved caused the earth’s crust to compress and fold like a rug into long subparallel ridges. Continued pressures caused originally horizontal layers of rock to tilt vertically, sometimes overturning completely. The mountain chained formed extended from Poland and Germany west through Belgium and southern England, then to Newfoundland and southwest to Birmingham, Alabama. The current Blue Ridge Mountains made up the western edge of a huge anticlinorium. Some researchers believe that this mountain range may have rivaled today Himalayas, reaching elevations of five miles high. As the ancient sea closed, Pangea was born. Between 190 and 100 million years ago, another stage of rifting occurred. North America, Africa, and Europe began to pull apart as the current Atlantic Ocean began to form. By the beginning of the Cretaceous, 130 million years ago and the last period in the age of dinosaurs, erosion had once again leveled much of the land, leaving behind only remnants of the Himalayan-like mountains. Unlike the mountain ranged of the past, the current Appalachians would be formed by the same process that cut down the older ranges – erosion. Gentle tilting uplifted the Appalachian Region and lowered the coastal regions. The many streams and rivers running across through the low hills began to cut down through the ground and carry away eroded materials, forming large valleys in their wake. During my trip, we ran across some of the metamorphosed sedimentary rocks, mostly quartzite. But depending on where you travel, you can see many reminders of the vast history of this region. 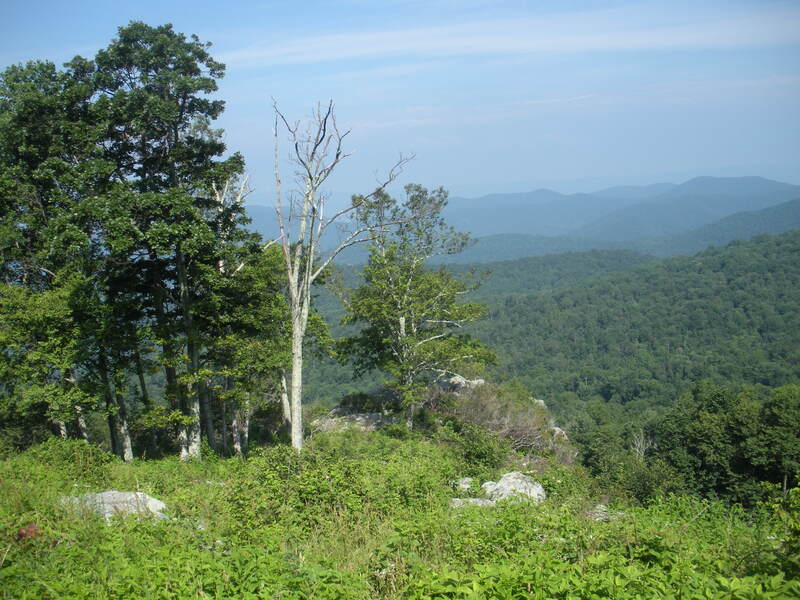 Most of the Blue Ridge crest in Shenandoah is capped by hard, erosion-resistant greenstone. While it may have been altered from the original basalt lava, the rock retains many of its original volcanic characteristics, including amygdules. In many places columnar jointing (think Devil’s Tower), formed during the cooling of lava, is evident. In one place, you can even see one of the ancient granite hills that was drowned by lava flows almost 800 million years ago. Waterfalls flow down “steps” formed due to the multiple layers of individual lava flows. Additionally, many fossils are preserved in the metamorphosed sedimentary rocks in the park. Getting back to the trip…at some time in the early afternoon, the rain started. Beneath the dense canopy of trees, only a fraction of the rain seemed to be falling on the two of us. Even as a thunderstorm, complete with lightning, rolled overhead, there was little more than a heavy sprinkling of rain during this storm. We had lucked out and, after using our ponchos to cover our backpacks, continued our hike. The rain soon let up and the dark, heavy clouds made way for more blue skies and sunshine. Around 5:00 pm, we came across one of the periodic huts maintained by the Appalachian Trail Conservancy. The huts are stone and wooden construction, three walls of stone with a wooden floor elevated about two and a half feet off the ground and a wooden loft which, you might imagine , is used for storing your gear during the night or as additional sleeping space should enough overnight hikers end up at the same location. It was here that we met Sam, a man is his 50’s who clearly hadn’t been off the trail in some time, as evidenced by his dirty clothes, rough appearance, and pungent aroma. Unlike most through-hikers nowadays, Sam carried all his belongings in his hands and tucked under his arms…no backpack of any kind. Despite Sam’s offensive smell, he was a friendly and shared a few stories with us, including his run-in with a bear the day before. Luckily, Sam’s bear encounter was during the daytime and the bear was merely crossing the trail a couple hundred yards ahead of him. We spoke with Sam while we took our boots off and rested for a while before hitting the trail again. Our goal for the day was only a mile and a half away and we had plenty of daylight left. The first mile since leaving the hut was all uphill. A long section was so steel that the trail wound up the hillside since a straight shot would’ve been near impossible while carrying so much weight on our backs. Once we reached the summit of the hill we were climbing, we were close to an area where we planned on camping for the night. 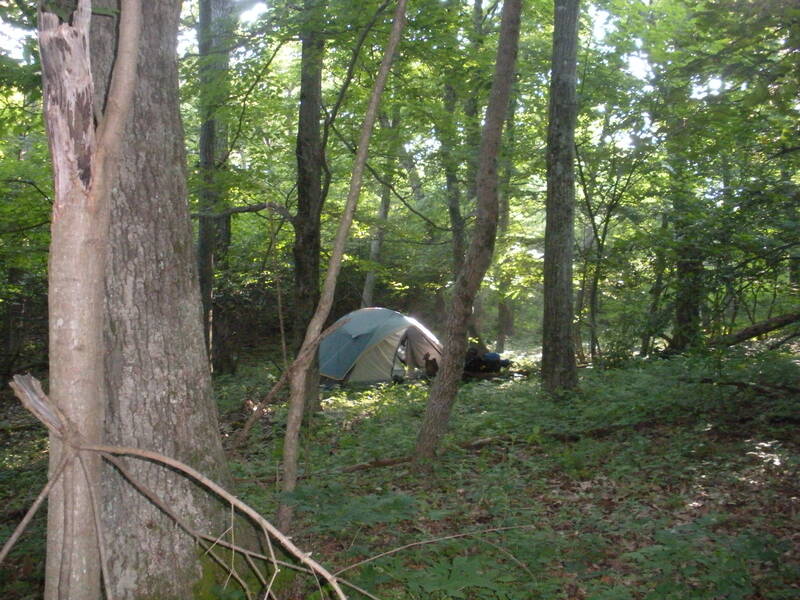 While backcountry camping in the park, you are required to remain out of sight from all trails and roads. We found a nice spot over the crest of a hill east of the trail. After setting up camp, we took all our food about an eighth of a mile south to prepare out dinner and hang the food. Now, if we splurged on anything, it was the food. Chunky beef soup was on the menu, and a nice cooked meal with real meat was sounding pretty good compared to the dehydrated foods and trail mix that we had been eating all day. Placing our camp stoves on a couple of flat rocks, we heated up the cans and started eating. The food was hot, but tasted great. About five bites in, the rain decided to grace us with its presence once more only, unlike earlier in the day, this time it poured. I quickly scooped up a few more spoonfuls before ditching the food. We put all our trash in a plastic bag, which we then placed in the waterproof bags with the rest of our food and strung up a tree with parachute cord, at least ten feet in the air and four feet out from the trunk of the tree. This is necessary to keep bears, and most other animals, from getting your food. It was now 8:00 pm and after making a mad dash back to our campsite, we were in out tent with nothing left to do but change out of our wet clothes and fall asleep to the sound of the rain on the polyester. 10:00 pm. I’m startled awake to the sound of a large stick snapping somewhere to the east of the tent. I’ve been camping plenty of times before and something like this doesn’t really frighten me, so I roll over bunch up my makeshift pillow (tomorrow’s clothes), and try to fall back asleep. Another snap…then another. It sounded as if someone were walking through the woods, and coming in this direction. I tried to convince myself that it was something much smaller than what it sounded like, remembering that even such creatures as chipmunks and small birds in the underbrush and dead leaves of the forest floor can make quite a bit of noise. But I knew this was no chipmunk. I quickly thought it may be a deer, but it was definitely alone…a buck maybe? It couldn’t be a person. It was too late at night, pitch black outside and too far away from the trail for someone to be walking. Additionally, the direction the noise was coming from was opposite that of the trail, and the topographic map we carried showed that there was nothing to the east of us except wilderness for miles, not even another trail or access road. The crunching leaves and snapping branches crept closer, sounding like it was coming right towards the tent, on my side. I remained perfectly still, mostly to listen, but also to not call attention to my existence in the animal’s environment. As the footsteps came closer, I could tell the were not coming directly toward the tent but passed by it, about ten or fifteen feet from the front door flap. It was at this point that a new sound made it perfectly clear exactly what animal was visiting our campsite…I heard a growl. Very low and almost a grunt. There was a bear just outside the tent. Knowing that this bear probably wasn’t Winnie the Pooh satisfying a late-night honey binge, I now had reason to continue my statuesque demeanor. The bear continued walking pass the tent and in the direction of our food. I relaxed a little and, when I felt the bear was far enough away, leaned over to Ben and woke him up, warning him to keep quite unless he wanted to meet the bear a little more close up. The bear, seemingly knowing that I needed confirmation for Ben, who may have been doubting my story, can back. This time, however, it turned off toward the north before reaching the tent, and went on its way. The rest of the night was long but, thankfully, uneventful. The next morning we planned to hike another mile to an access road which we could then follow to a parking lot off of Skyline Drive. Here, as we decided the night before, we would end our trip, be picked up and head home. We made it to the parking lot early, so we backtracked along the road to a pull-off which overlook the Shenandoah Valley. We waited here for our “rescue squad” and took a few pictures, one of which is below. Aside from our late night visitor, lack of campfires (which are prohibited in the park, except in designated fire pits), and the fact that you have to carry everything you bring on your back (read this as meaning you bring nothing except the bare essentials), backpacking trips like this can still be very enjoyable, but it is not for everyone. Our trip may have been cut short, mostly due to some lack of preparedness and a some overestimation of our abilities, but we were both very happy that we made it a full ten miles along the trail. If you are an outdoors person, I suggest you try a backpacking trip at least once. If you’re not sure about it, plan something small in a well-traveled area where there are plenty of opportunities to cut the trip short should you find yourself not quite as well-prepared as you thought. The Shenandoah Nation Park section makes for some gorgeous views and some great geology. Because the Appalachian Trail and Skyline Drive parallel each other for the entire length of the park, this trip is great for hikers and motorists alike, though you’ll each get different perspectives, both ways make for a memorable experience.